Liverpool extended their pre-season winning streak to six matches on Wednesday evening with an enjoyable 4-1 victory over Norwegian outfit Valerenga at the Ullevaal Stadium in Oslo. In front of the club's principal owner, John Henry, the Reds maintained their impressive form through goals from Luis Alberto, Iago Aspas, Martin Kelly and Raheem Sterling; their clean sheet record was ended by Giancarlo Gonzalez, though. The pre-match team news had confirmed nine changes to the Liverpool team which celebrated Steven Gerrard's testimonial by beating Olympiacos on Saturday - Joe Allen and Aspas the two men to retain their starting berth. 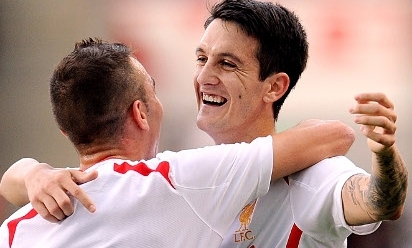 An incisive burst by Stewart Downing served notice of Liverpool's threat to the hosts as early as the third minute. The winger knocked the ball around his marker and showed lightning pace to collect the ball on the other side, before drilling a centre which Jordon Ibe was unfortunate not to connect with. First-half captain Jordan Henderson whipped a free-kick high and wide in the eighth minute and Allen trained his sights with a wayward effort shortly after. Continuing the theme, Ibe skipped beyond two challenges to work space - a rash shot followed, though. Aspas then had two inviting opportunities to break the deadlock on the quarter-hour. Downing claimed possession and drove forward in a two-on-one scenario, releasing the Spaniard to blast goalwards. Saved. The summer signing swung a boot seconds later at the left edge of the box but his strike drifted the wrong side of the far post after taking a deflection. The subsequent corner looped off Andre Wisdom and briefly scared home goalkeeper Gudmund Taksdal Kongshavn, and Ibe directed an attempt off target as the Reds established control. A wonderfully slick passing move, prompted by Alberto, Allen and Downing, provided time and freedom for Ibe to work a reactive Kongshavn once more. If that save was impressive, his next was inexplicable. Jon Flanagan supported on the left flank and curled a perfect delivery into the area for Downing, who will still be wondering how his stabbed strike was kept out by the stopper's head. But Kongshavn's charmed goal was finally breached within moments. Aspas' clever chip bounced away off the crossbar and when the Norwegians failed to clear, Alberto volleyed a precise finish into the bottom corner to secure a 31st-minute lead. It lasted just four minutes, however. Valerenga defender Gonzalez was the dominant aerial force from an inswinging corner and sent a powerful header flying past the palms of Brad Jones. But the visitors nevertheless entered half-time 2-1 ahead as Aspas finally beat Kongshavn, tapping home a simple finish after a perfect set-up by the effervescent Downing. The break precipitated 10 changes by manager Brendan Rodgers, with only Wisdom remaining on the pitch. With Oussama Assaidi and Raheem Sterling operating with fresh pace on either flank, the Reds started the second period brightly and extended their advantage further after 54 minutes. Valerenga struggled to deal with a corner which landed plum in the centre of the penalty box and it was defender Kelly who forced the ball over the line for 3-1. Within 60 seconds, another set-piece worried the home side and Kolo Toure thumped a header against the bar. Fabio Borini was equally close to adding a fourth for Liverpool as he capitalised on a loose ball, rounded the goalkeeper and aimed for goal from a narrowing angle. It rolled all the way along the line but refused to hit the net. The Italian crashed another effort from 20 yards against the crossbar as the clock ticked into the final 15 minutes, before Sterling slotted home in the closing moments so that the Reds could celebrate a sixth straight success.